Wireless networks have been an outstanding success, exceeding expectations multiple times. Over the last few decades, performance and coverage have improved tremendously, and we increasingly rely on wireless connectivity to keep in touch with each other, to be informed and entertained, and to carry out a growing number of the tasks we do in our daily lives. With IoT, wireless networks are taking on our environment, too: they have started to monitor the things that inhabit our surroundings and to take actions within our world. If we include both cellular and Wi-Fi, wireless has become the dominant way we communicate with each other – as the preferred alternative not only to mail and fixed calls, but also to wireline communications. The latest laptops have only wireless connectivity; they no longer have an Ethernet port. Yet, despite their success, our wireless networks are not terribly smart – or efficient. In most cases, they still strive to push through as many minutes of voice calls or bits of data as they can, regardless of what those calls or bits are, who is sending them, what service or application they are tied to, how valuable or urgent they are to the operator or the subscriber, and what the network conditions are. Utilization of resources is uneven, and networks do not cope well with congestion. In part this is due to the uneven distribution of subscribers across the footprint – even in this age when we are always online texting each other, people tend to aggregate in the same places, at the same time, making life hard for network operators. A lot more optimization in the use of network resources is possible than is being done. This is about to change. 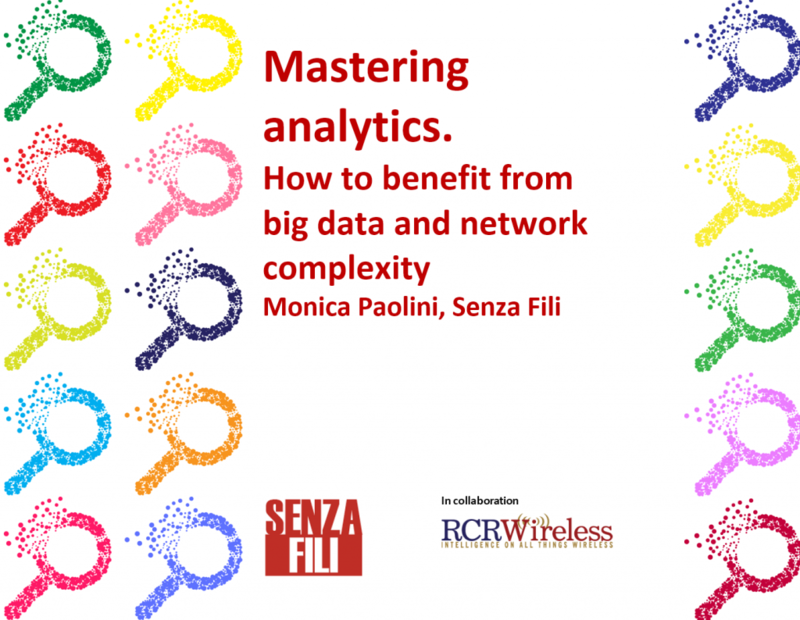 Networks are about to become smarter and more efficient, and at the center of that transformation is analytics. The rising complexity of wireless networks and of the traffic they carry is the fundamental enabler. Complexity provides the necessary ground for optimization. In a homogeneous system, the scope for optimization is limited; brute-force management of resources prevails. New technologies and more powerful processing capabilities are also enablers of the transformation to smart and efficient networks. But a key driver is the operators’ realization that end-to-end network optimization is no longer an option – it is a necessity. Complex systems, however, are difficult to understand, manage and predict. And wireless networks have only recently started to become complex, so in the wireless industry as a whole, we have a lot to learn. Not just the operators – everybody in the ecosystem, from vendors to, well, analysts. We have to make many decisions about how to manage this complexity and turn it to our advantage, instead of being swallowed by it. Machine learning (ML) and artificial intelligence (AI) can help in this task. They enable vendors and operators to uncover, understand and manage the emerging complexity in wireless networks – and specifically the parts of this complexity we are unable to grasp with the tools we have today. We do not need ML and AI to manage what we know already: the algorithmic-based, deterministic approaches that we use today are likely to be more effective and requires less effort. ML and AI can help us to uncover unknown properties of wireless networks, identify correlations and anomalies that we cannot see by inspection, and suggest novel ways to optimize network deployments and operations. This report is about how analytics can make wireless networks smarter, how analytics can leverage ML and AI to do so, and why this is happening now.